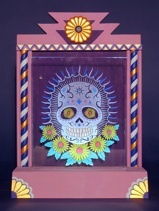 Few people know that Santa Fe is the home of one of the most unique art businesses in the country, that of Dobbins Studios, south on the historic Turquoise Trail. 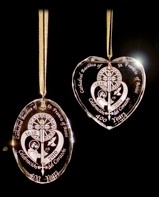 The founders Norm and Ruth Dobbins are internationally recognized authorities on the art of abrasive glass etching who have taught, lectured and written about these techniques for the past 35 years. 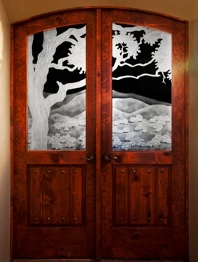 In addition to those activities they have created striking etched and carved glass for homes, restaurants, hotels, office buildings and public installations. All works are executed in a variety of techniques, from surface treatments to complex carved and sculpted images (reminiscent of Lalique) to delicately shaded images. Although glass is their primary canvas, they also work on ceramics, stone, wood and metal. Ruth Dobbins also works in fused and cast glass and often combines these techniques with those of etching and carving. 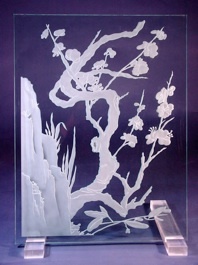 Being on the forefront of developments in glass etching technologies Dobbins Studios and their dba Professional Glass Consultants is often asked to consult, train or collaborate with other companies or artists. Former consulting clients include R.S. Owens (makers of the Oscars), Tiffanys, Ikonics Corporation and Nambe of New Mexico. Collaborations include 5 years of work with internationally acclaimed New Mexico artist Judy Chicago as well as work for Rebecca Tobey, Ed Noisecat and Carol Coates. Norm Dobbins unexpectedly passed away in 2008 and was awarded a Lifetime Achievement Award from the Art Glass Association in 2009. Ruth Dobbins is continuing the operation of the studio and is available for future commissions.